Get The Payoff Principle Workbook PDF FREE in 3 easy steps! Check your email for the PDF download AND some extras! Where do you hope to go with your life, your career, and your relationships? How will you muster the energy to keep on keeping on, in the good times and the bad? What skills do you have to learn--and then use--to make sure you get the payoffs you really want in your professional life and your personal life? 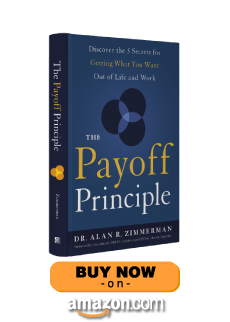 The Payoff Principle then works as your guidebook, teaching you how to apply the formula to achieve success at work, at home, and everywhere you go. Plenty of people have gotten the payoffs they want, whether consciously and deliberately or accidentally and luckily. But, you don't have to depend on luck anymore. You can have a formula for getting what you want. You can have a practical set of strategies guaranteed to deliver greater happiness and success than you've ever experienced. All you have to do now is read The Payoff Principle to learn how to implement the formula. Everyone wants to be happy. Many yearn for success. Most have no idea how to have either. But now you can have both. In The Payoff Principle, you’ll learn the simple formula for getting the payoffs that you want in your life and career. Bookmark this page and enter your receipt information to receive The Payoff Principle PDF Workbook for FREE!" This incredible audio series features powerful interviews from industry leaders and experts Dr. Sam Chand, Lisa Ford, Marshall Goldsmith, Tom Hopkins, Lee Labrada, Mark LeBlanc, Bill Lee, Jim Meisenheimer, Dr. Gregory Poland, Dr. Sidney Simon, Art Sobczak, and Jill Blashack Strahan. "If you really want to achieve something, put The Payoff Principle to work!" #3The simple but powerful process for achieving every personal and professional goal you’ve ever had! 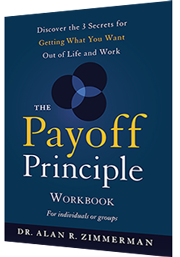 workbook FREE when you order The Payoff Principle today! Copyright 2015, Dr. Alan Zimmerman. Enter your receipt information below to receive the 147-page The Payoff Principle PDF Workbook for FREE! Still need to order The Payoff Principle? DOWNLOAD MY FREE PDF BONUS NOW! As an added bonus, you'll also receive Dr. Zimmerman's Tuesday Tip! We respect your privacy and will never share your information with anyone.